Posterior Leads are helpful in suspected Posterior Myocardial Infarct. They are performed by placing V4, V5 and V6 electrodes in the same intercostal space, but continuing into the patient's back. V7: In the fifth intercostal space and the left posterior axillary line. 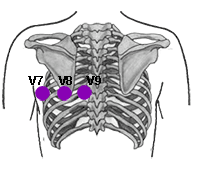 V8: At the same level as electrode V6 and the midscapular line (tip of the scapula). 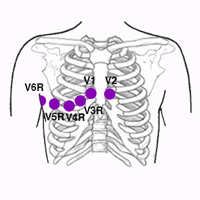 V9: At the same level as electrodes V6 the left paravertebral line. Once the Electrocardiogram with Posterior Leads has been made, you must write the word Posteriors in the ECG header, and overwrite V7, V8, V9, on the leads that have been replaced by posterior leads. This will avoid confusion in future readings of this Electrocardiogram. Right-Side leads are recommended in patients with Inferior Myocardial Infarct, when Right Ventricular Infarct is suspected. V1: Same as normal location. V2: Same as normal location. V3R: On a line midway between electrodes V1 and V4R. V6R: At the same level as electrodes V4R and V5R, in the left midaxillary line. As Posterior Leads, when an Eletrocardiogram with Right-Side Leads has been made, to avoid confusion, you must write the word Right in the Electrocardiogram header, and must write also a letter R after the name of replaced precordial leads (V3-V6). This clarify that it is a Right-Side Electrocardiogram.